Unlike the secular new year, the Church begins its year on 1st September. This coincides with the bringing in of the harvest, the fulfillment of the year’s agricultural work. In the UK, our academic year is based on the Church new year, so our young people begin their new courses of study in September. The beginning of autumn is a time of transition, a liminal time of gathering, laying fallow, ploughing and sowing. We reflect on the previous year’s work, we take time to learn and grow, ready to labour for next year’s harvest. The entire history of God’s people points towards the Incarnation of Jesus Christ. Incarnation is the ’em-body-ment’ of God, when God becomes man. 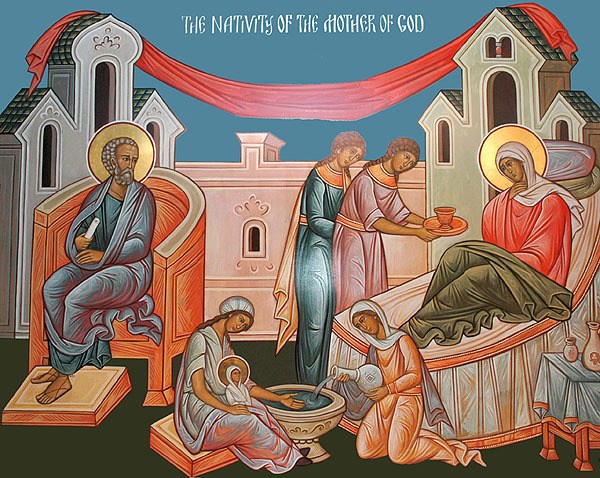 The tangible start of Jesus’ birth is the birth of His mother. Mary, the ‘God-bearer’, is in her own right the single most important person to have ever lived. Her birth and early life are an anticipation of the birth of her son, the God-Man, and it is only through her faithful consent that Salvation was able to enter the created universe. Mary’s parents, Joachim and Anna, were elderly and childless. They were part of a small remnant of faith, who were poor and needy, who waited patiently for the coming of the promised Messiah. Joachim and Anna suffered disgrace and dishonour within their community due to their childlessness. Being without children was thought to have been a punishment from God for some unknown sin. In spite of their dishonour and poverty, they nevertheless remained true to God. Joachim and Anna prayed for a child well into their old age. Finally their prayer was answered and Anna gave birth to a daughter, Mary. The child Mary, being born as a result of enduring faith and love of God, would herself grow in holiness and purity, eventually being granted the greatest of all honours: to be the Mother of the Messiah.